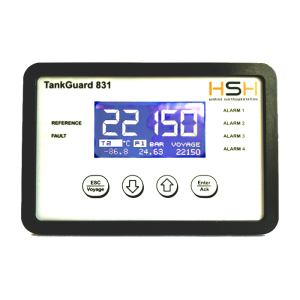 The HSH Tankguard 831 has been designed for centralized display of cargo conditions, e.g. pressure/level/temperature in cargo tanks on vessels. 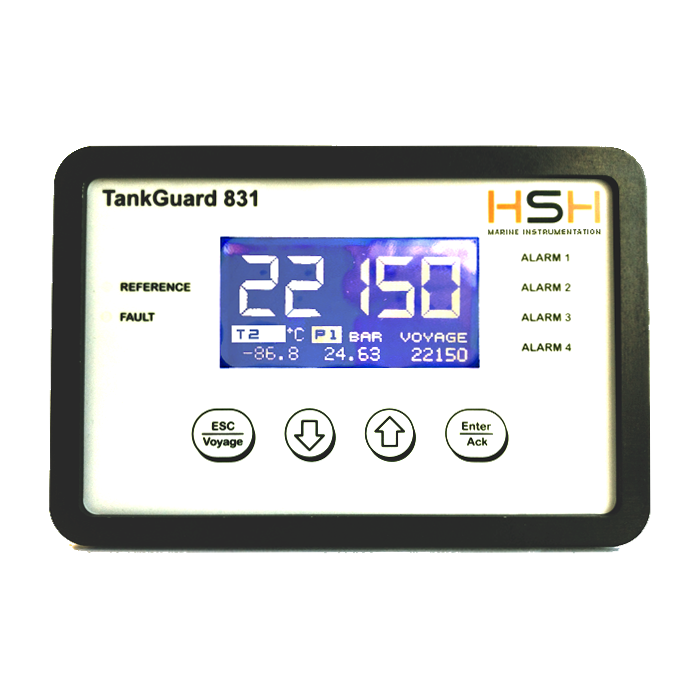 The Tankguard 831 (TG831) is also equipped with hardware and software to monitor the HSH FTLG 806 & 807. The transmission circuit between level gauge and remote level indicator is intrinsically safe as well as fail-safe: it is continuously monitored and in case of a failure that would result in an erroneous level indication. Additionally, input & output signals are provided for communications with remote data acquisition systems and/or analog or digital sensors, e.g. 4-20 mA and HART communication are supported, Modbus RS232 or RS485 and Modbus over TCPIP can be used for communications with AIS. The actual /average or voyage level is displayed by means of a digital LCD display. Depending on the settings the level can be displayed in “ullage” or “innage” mode with increments of 1 mm. “Innage” read out is most common (“zero” level at tank bottom). The remote level indicators are designed for flush panel-mounting and can easily be incorporated in (cargo) control panels. As the indicators are solid state (no moving parts), no periodical maintenance is required. Power consumption: 1.3 Watt nom. / 4.2 Watt max. Power input: 12 V DC max. Extended Log – A log is constantly logging all actions that can be monitored, e.g. times reference switch activated, occurred errors & alarms, total traveled distance.